The ICC Cricket World Cup was first contested in 1975 and held every 4 years since. In the eight tournaments held so far, five teams have won, Australia have been the most successful World Cup team, winning three times. West Indies won the first two tournament while India Pakistan and Sri Lanka have won one each. Eight teams participated in the 1975 tournament: Australia, England, the West Indies, Pakistan, India and New Zealand with Sri Lanka and a composite team from East Africa, One notable omission was the South African cricket team who were not competing due to the International sports boycott. The statue of cricket's greatest player, Sir Garfield Sobers, was rededicated at its new home, the spanking Kensington Oval. Sir Garfield, Prime Minister Owen Arthur and members of his Cabinet, as well as a number of former Test players, were on hand for the hour-long ceremony. Reverend Wesley Hall, who played cricket with Sir Garfield, described him during a brief address as a great but humble man. "There is not a trace of egotism in his body, but massive strokes of humility," Hall declared. 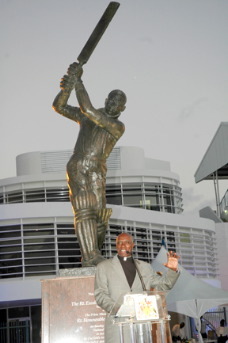 Last year, the statue was moved from the Garfield Sobers Roundabout in Wildey, St Michael, to be a major attraction at the rebuilt Kensington Oval.